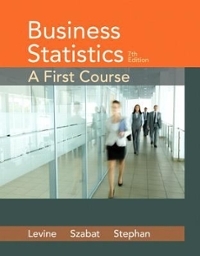 Business Statistics 7 Edition NOTE: You are purchasing a standalone product; MyStatLab does not come packaged with this content. If you would like to purchase both the physical text and MyStatLab search for ISBN-10: 0133956482/ISBN-13: 9780133956481 . That package includes ISBN-10: 0321847997/ISBN-13: 9780321847997, ISBN-10: 032184839X/ISBN-13: 9780321848390 , and ISBN-10: 032197901X//ISBN-13: 9780321979018.